The main entrance to our club is kept very simple. We have about 50 yards of shoulder on the north side of the entrance and about 200 yards south of the entrance that we manage. 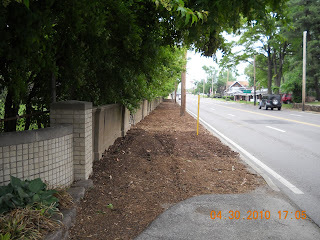 The county places mulch every season along the shoulder in front of the cemetery. We are responsible for our section and have not done anything to the area except trim trees and pick up leaves and trash. 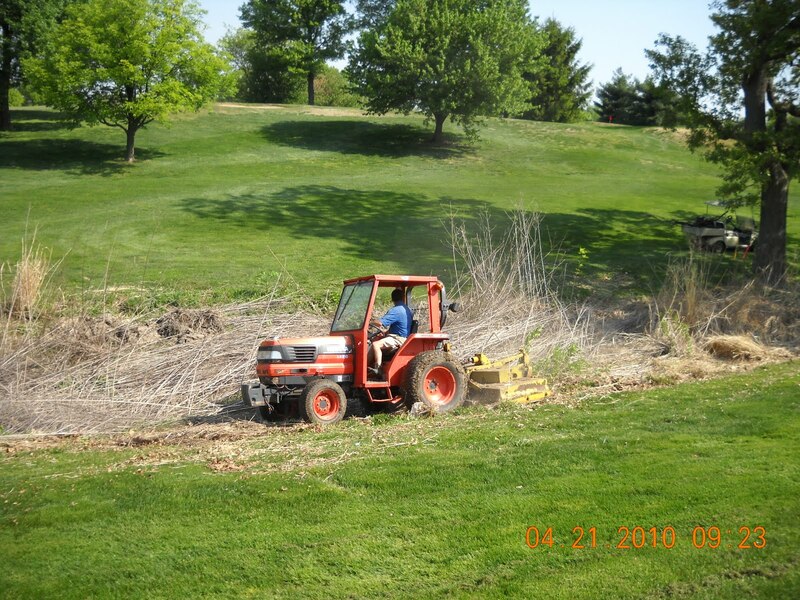 We accumulated a large pile of tree chip material from our Tree Management Program and have used this material on the woodland garden on #9 and the back entrance to the club along Wallingford. We decided it was time to improve the Lucas and Hunt entrance or at least cover up shoulder area between the road and fence line. It should look good for our membership and we do receive a great deal of visitors to the course or clubhouse who might only attend on one occasion and we prefer to leave them with a very good impression. The staff placed about 35 loads on the north side of the road with our small utility vehicles and raked the chipped mulch in place. We placed a small section along the south entrance at this time as well. We need to complete the remaining part of the woodland garden area and will then utilize what is left. We will probably run out of material and will contact our tree trimming company to get a couple loads of chips hauled in to finish the job on the south end. Just south of the entrance showing the difference between the chipped mulch and the gravely material that is now in place. 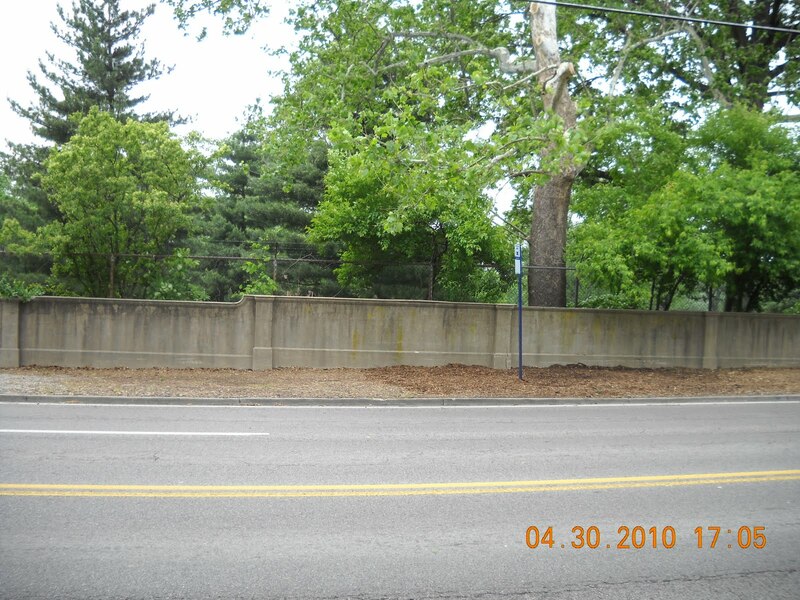 The completed north side of the entrance looking toward Natural Bridge Road. The 11th green has always been a green that is very slow to drain. It is probably one of the flattest greens on the golf course. 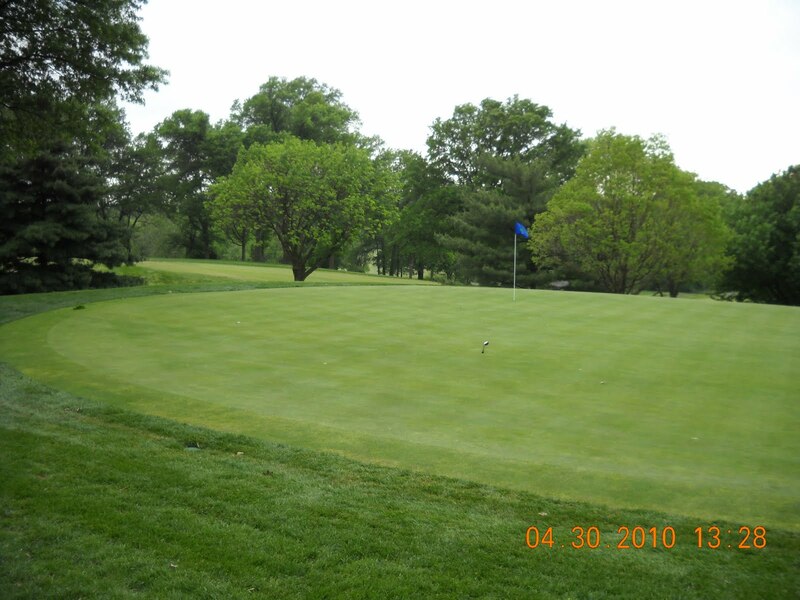 Most greens during heavier rains will drain water off of the surface of the green to the sides or the direction that the green slopes which is usually back to front. Greens that are flat have a tendency to drain more water through the profile. 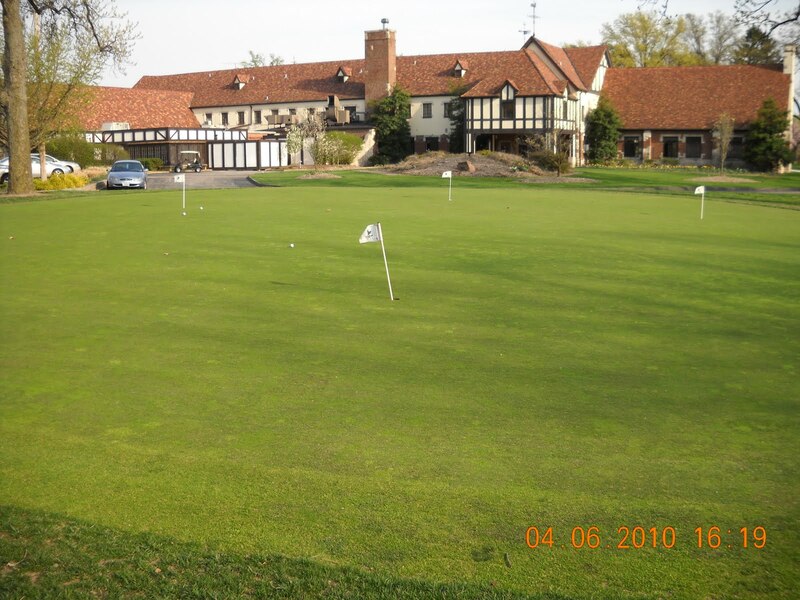 Also, our greens with no sub-surface drainage must rely upon the water to penetrate either through the soil profile under the green or move between the sand/soil layer to the lower area of the green where water accumulates until it can slowly drain from the green. The back left section of the green also has a low spot which puddles during relatively moderate rainfall. As you remember from last year, we placed a swale and catch basin to re-direct the water underground that was coming over the back left corner of the green from the area of the 4th tee and the cemetery. We've noticed over the last couple of weeks that the green seems to be holding more moisture than normal. It might not be any worse than normal but the mowers have been scalping slightly and we've also seen some algae forming on the green surface. In an effort to speed up the water penetration into the green profile, we used our deep tined aerifier with a 3/8" solid tine to poke some holes in this section of the green. The actual hole size is smaller than a pencil eraser. We usually do not place hole locations back in this section of green but if you should end up in this area, there should be no disruption to your game. This is also the walk on and walk off area for the green which creates some additional compaction issues. We intend to leave the holes open to allow for better water penetration and preferring not to deal with excessive sand issue on a green. The situation might not be any worse than years past but we felt we should do something to help this area dry out a little more quickly over the next couple of weeks to improve the overall health of this section of the green. You can see how relatively small the holes are that were placed in the green. The green was aerated from the left of the 04 on the date stamp of the picture at a 45 degree angle through the flag stick. I also laid a golf club out in the middle of the green which marks the line as well. Our golf season is in full swing and we've made adjustments gradually from our winter hours of 7 a.m. to the starting time of 6 a.m. during the week for the rest of the season. This gives our staff enough time to go out and begin setting up the course for our members and guests. This includes changing holes and mowing greens. Our weekend schedule begins at 5:30 a.m. because the tee sheet is open at 7:00 a.m. for our membership. We limit our work on the weekend to mowing greens, resetting tees and holes, raking bunkers, general debris clean up and watering our greens as needed. 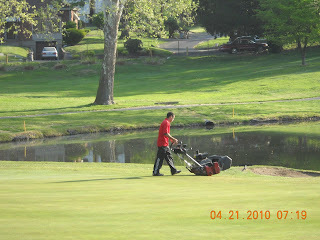 There is an occassion where we might mow some rough or fairways if weather prevented this from taking place on Friday. We attempt to do this quickly and get out of the way so you can enjoy your weekend in peace. I forgot to change my time stamp to daylight savings time but this is the view from a walking mower at 5:52 a.m. last Saturday morning. 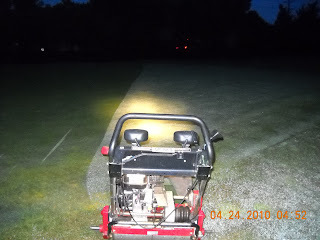 We need lights for the first green or two and are then able to work in natural light as the sun starts its day. The 3rd bird house from the bottom of the hill between 12/13 in the native area has 4 Eastern Bluebird eggs waiting to hatch. I've not checked any of the other house up the ditch line but there might be another pair toward 11 tee. I have seen some Tree Swallows hanging out on a house or two as well. They like to nest in the bb houses as well. 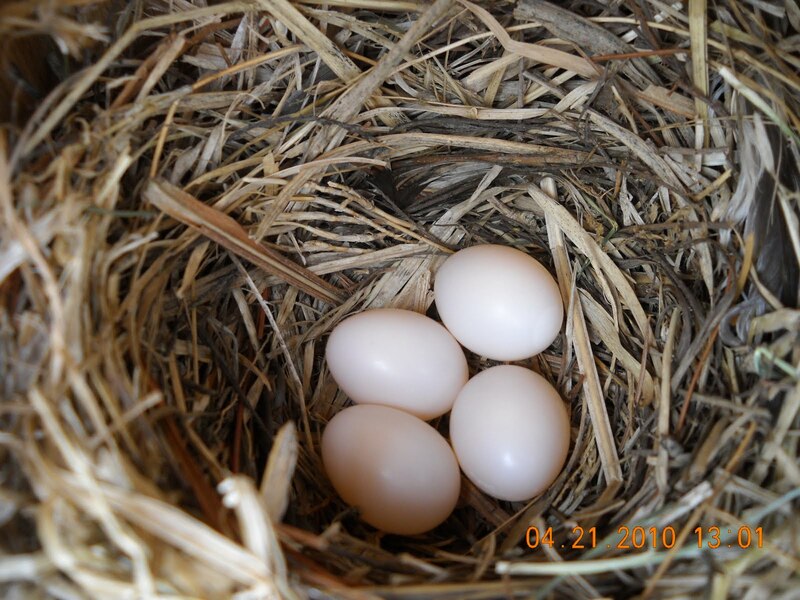 Bluebird eggs in 3rd house from bottom of 13. Each season, the native prairie area between holes #12/13 is mowed. Normally, most of the lower area and some of the ditch line is too wet to mow. 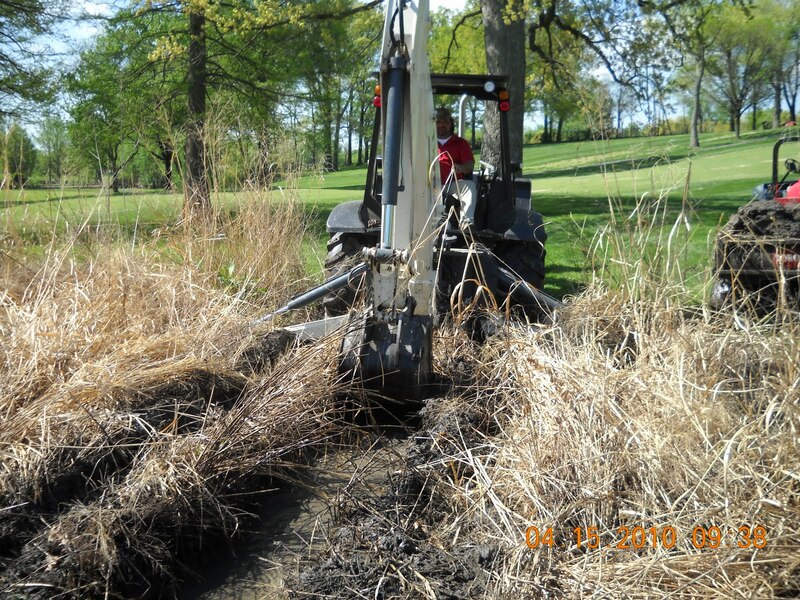 This season as the rain has stopped and warmer temperatures have arrived, we were able to use the brush hog throughout most of the area. We did have to pull the tractor out of a couple of spots but overall it went well. Russ on the upper end with the tractor and brush hog. We are going to go in this year and use some broadleaf weed killer on most of the upper end to eliminate the giant ragweed from the area because of the problems it creates in the fall for those with allergies and the horrible stalky remnants that are left at the end of the season. Just a little section to finish and it is all done for the season. The staff(Asst Skip, Russ, Tom and Jason) performed the first walking greens mowing of the season. 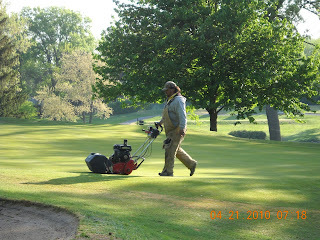 We are still in transition with our golf season staff which does not allow us to walk mow everyday. We plan to be walk mowing full time by May 1st. We will usually walk mow greens 5-6 times each week depending upon our topdressing program and weather conditions. It takes 4 guys approximately 2 hour to perform this work each day. Tom working on #9 green. Assistant Skip completing #16 green. As some have mentioned, the rough is brutal. We've hit the perfect storm a couple of weeks early. The warmer than normal temperatures over the last couple of weeks has created an explosive situation in our rough. 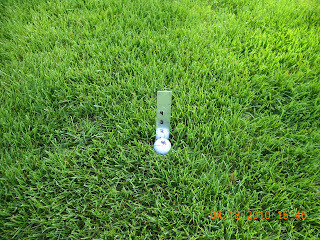 The grasses seed head production and growth of the turf has kicked into over drive from the 15-20 degree above normal days and at least 10 degree above average evenings. Usually this type of rough does not take place until late April to early May. The lack of frost has allowed the turf to continue to grow as we sleep. Seed heads have make it even more difficult to get the club head through the golf ball. We have been lucky that rainfall has been reduced which has allowed us to keep the mowers going each day. I know some wonder why we keep the rough as long as we do. Our height of rough is kept at 3" during the season for a number of reasons. 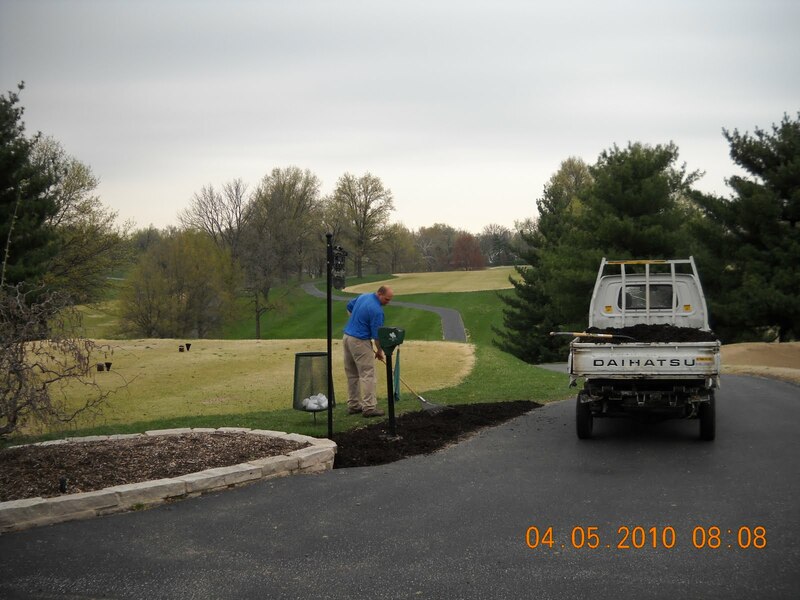 A healthy height for our cool season grasses to reduce the potential damage from pests,(insects, disease, weeds) water loss from trees during the summer, and cart traffic. Longer leaf blade can generate more chlorophyll which is the building block of the plant leading to the development of more energy for bigger and deeper root systems and thickens the leaf blade which can help protect it further from pests. Reduces the competitiveness of bermuda grass until the heat of July and August. Protects the scoring of the golf course which has no fairway bunkering. PGA Professional Nash Haxel made the following comment regarding playing out of spring rough. "Learning how the ball will react from different types of lies is a real key to success in the spring time. When the ball is lying down in that tall green rough that we are experiencing now, try the 7,8,9 irons and play the ball back in your stance to create a steeper attack angle." 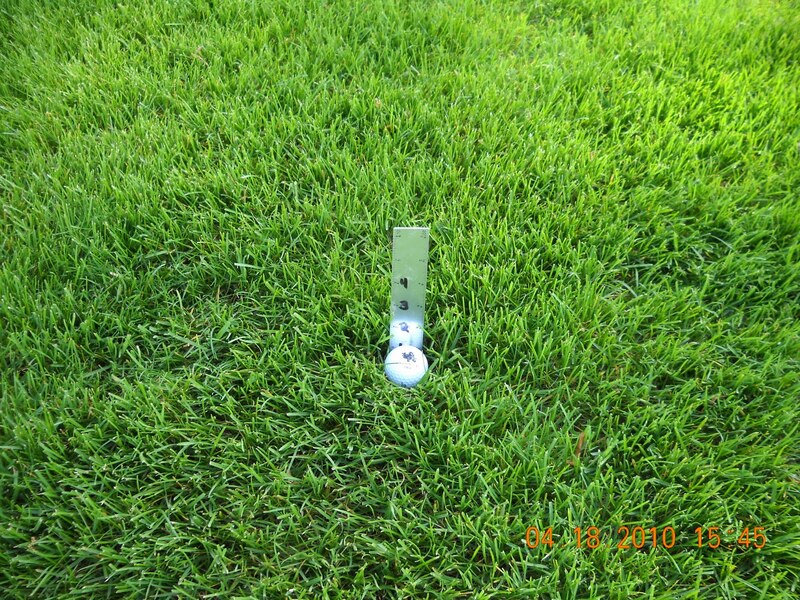 The University of Missouri has a guide sheet for proper mowing practices which includes a discussion on proper height of healthy well maintained turfgrass. 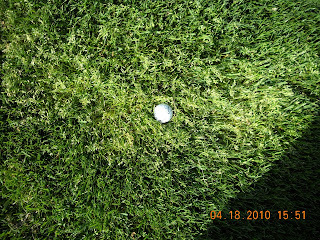 A view of a ball in the rough. The same view but a close up. Yes that is 3-4" rough. 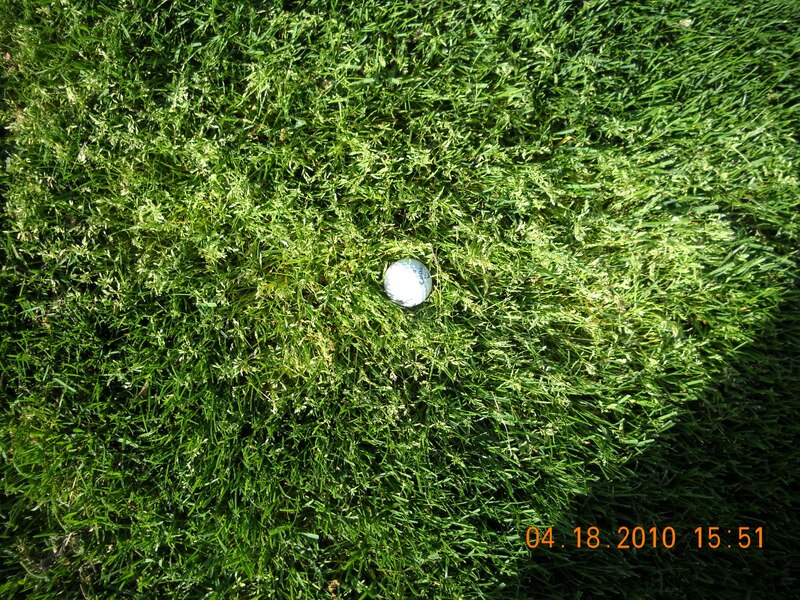 A section of rough you do not want your ball to fall into. A ball swallowed by poa annua in its full seed head stage. 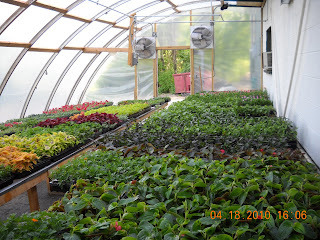 I thought I would give you an update on our greenhouse plant program. The plants are progressing nicely. They've all had a pinch or two to help them spread and watering has been insane with 85 degree temperatures for newly formed plants. Three times a day during part of the growing process. 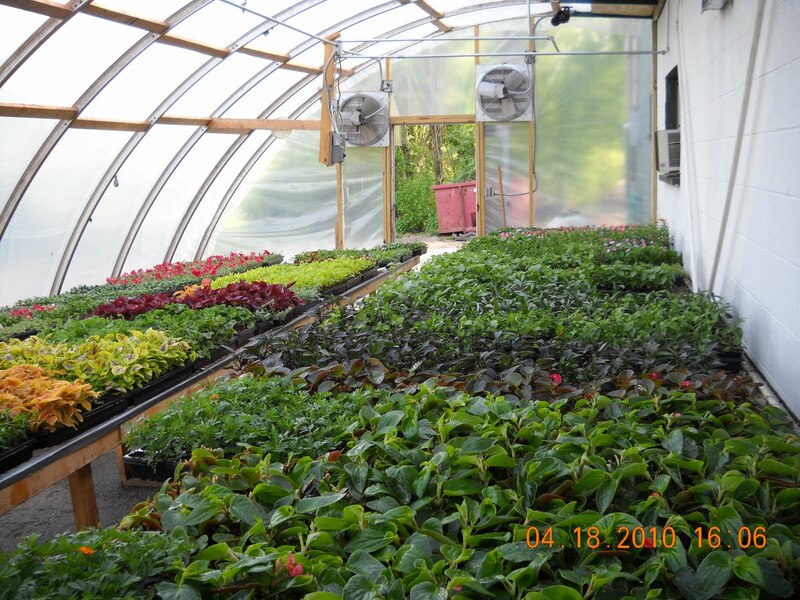 Our plant sale is scheduled for Saturday, May 8th. We will have a number of annual varities available for sale. Some wonder why we host the sale so late while most garden centers are going crazy right now. I plan the material for planting around the middle of May to protect from cold and or a cool wet period which is not very forgiving for some of the warm weather natured plants we have selected. 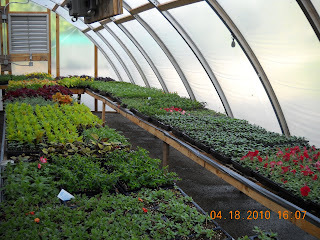 Also, are plants are not to size yet to be planted since we bring them in as late as possible to reduce heating costs and the labor reequired to maintain the plants on a daily basis. Leave a section of garden or a pot or two to fill with Glen Echo plants if you are in a hurry to get things planted. For our ladies, feel free to come down and check out the plant materials before our after your opening day round this week. The bottom of the hill on the right side of #13 has become a very wet area over the last year. It appears that drains are clogged and the native grass area has become silted in and is preventing water from draining from 13 into the drains and out of the area. 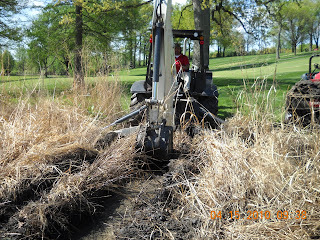 We are digging a small surface drainage trench with our backhoe thru the native area to allow the water to move out of the rough adjacent to the fairway on #13. 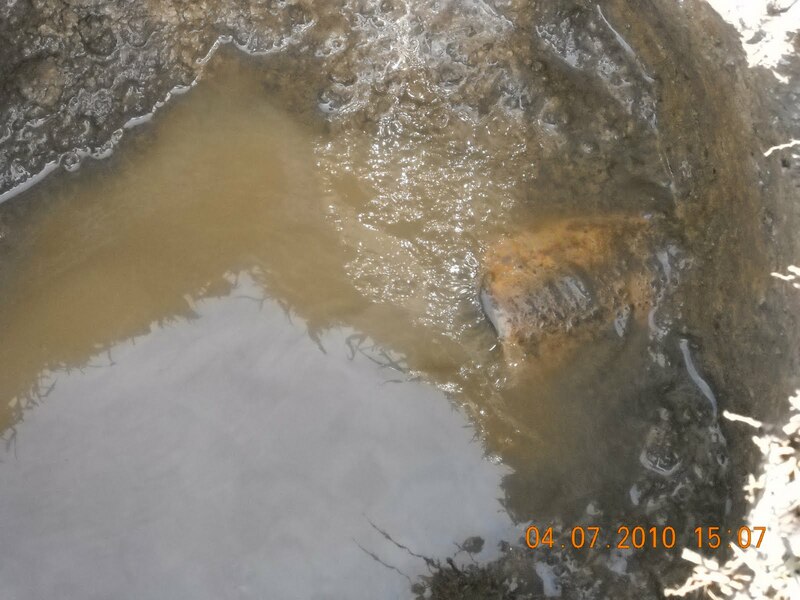 We are investigating some of the additional drainage in that area to see if there are sections that are clogged with roots or other foreign material. Our first objective is to give the water somewhere to go. As the area next to the fairway begins to dry, we will then attempt to get the water underground in a pipe so we can keep this area dry for hitting a shot and mowing. The area in question at the bottom of the hill in the right rough of #13. The tall green grass is just off of the begining of the fairway. #12 is in the background. Asst. 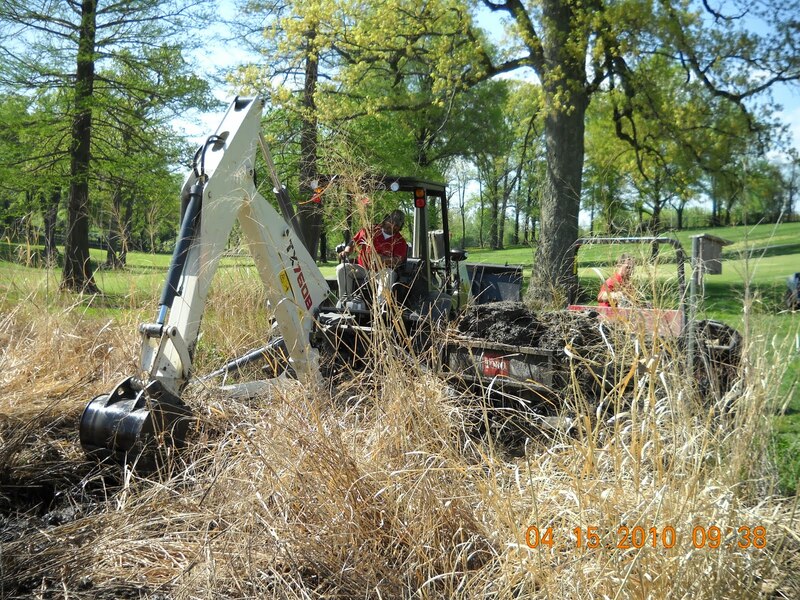 Skip digging a trench about 1' deep and the width of the bucket through the bottom of the native area between 13 and 12. 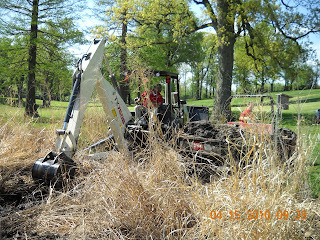 Russ in the background preparing to haul the material to the upper part of the native area where there is little native grass. This material will be transplanted in this area and should work well. The staff installed the water fountain on #9 lake for the season. Last season we had to do a major rebuild on the protective cage and some wiring work. This season was simple, load it up, drop it in the water and plug it in. 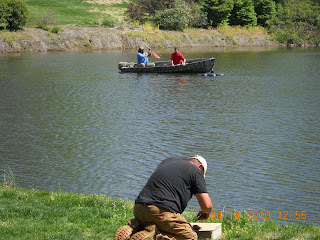 Asst Skip/his boat and Russ aligning the fountain in the lake. Mechanic Harry is holding the end of the line and preparing to plug it in. The fountain operating at the end of the day. Asst. Mike was out spraying the first cut of rough around a majority of our fairways this morning to reduce the competitiveness of the bermuda grass and continue the process of pushing it further away from the main play areas of the course. In some cases it was one pass and in other areas it was two or more. We basically were spraying between the cart path and a pass or two on the other side of the fairway. If the area was heavily shaded, it was skipped because bermuda is not as competitive in the shade as it is in the full sun. We sprayed about 10 acres of rough. 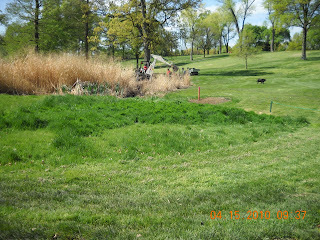 We are going to evaluate some of the areas between the tees and fairway for possilbe spraying in this program as well. 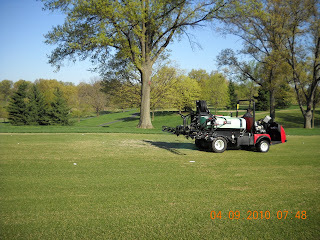 This spray will also kill broaleaf weeds such as knotweed, clover and dandelions which are prevelant on our golf course. Asst. Mike spraying between the bunker and approach on hole #18. 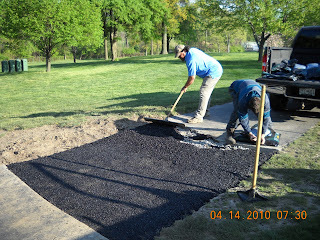 The staff completed the cart path repair along #18 this morning. A little more backhoes work yesterday to remove the disrupted surface and the roots that were pushing up the asphalt. Asst. Skip and Russ putting the final touches on the cart path repair work on #18. The damaged section of cart path caused by the tree roots from the tree being planted too close to the cart path. We seem to have the same problem each season with the green side of the main entrance road of #8. We have a large amount of fine leafed bermuda on this section of approach which is usually ugly until June and the bermuda is susceptible to spring dead spot. It will usually grow out of this ugly condition in the next few weeks but will be a little unsightly until then. We currently do not have this part of #8 fairway in our bermuda eradication program since a large section of the approach fairway would look like asphalt if we killed all of the bermuda. 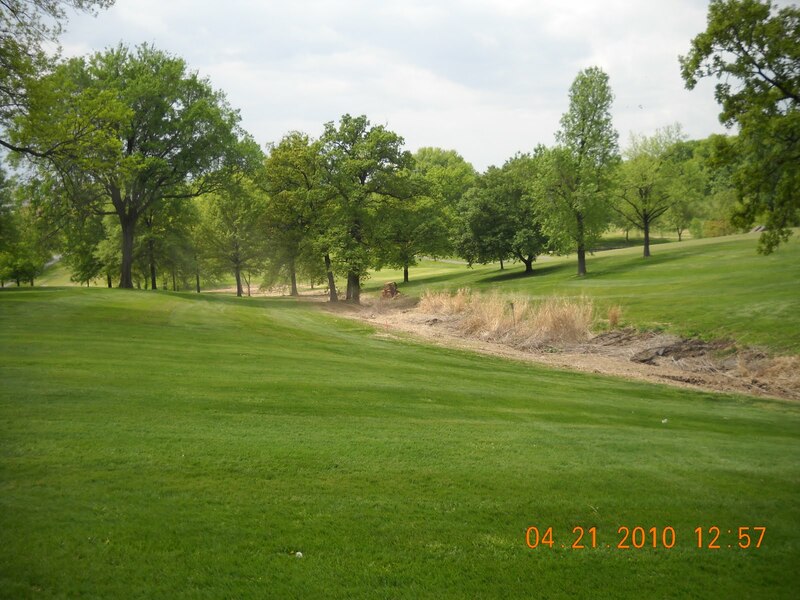 When the golf course was converted to zoysia in 1995, this was the only section of fairway that was not treated with RoundUp before the grass was stripped away. This is the reason for the heavy infestation of bermuda. #8 approach with spring dead spot. Smaller tan circles. An example of the size of the spots in comparison to my camera case. The spots are about the size of a cantaloupe. 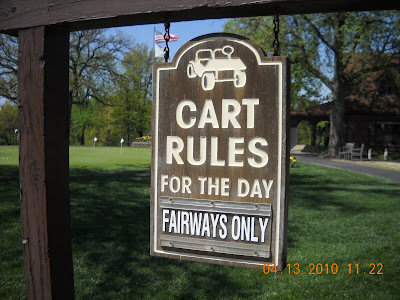 Golfing members favorite two words"Fairways Only"
It was great to change the cart rule today to allow all golf carts off the paths and onto the fairways. Our golf season has arrived. 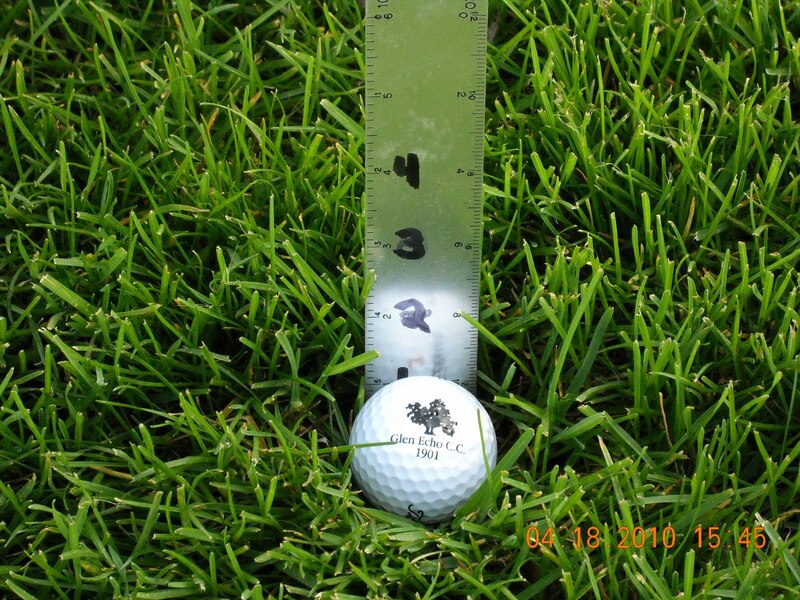 Our fairways will not be fully growing until June when soil temperatures have reached 75-80 degrees. Just a few reminders about the use of carts on the golf course for the golf season. It is helpful if carts enter the fairway in a 90 degree angle from the left or the right. This prevents the turf from between the tees to the fairways from being worn too severely. Once you've entered the fairway, we request that all carts stay on the fairway only unless you are ready to proceed to the green. Attempt to use different routes when reentering the cart path area to proceed to the green. It is obvious during the warmest part of the season where the traffic is traveling each day from the tracks made by the golf carts. Alternating from all the other tracks will protect our rough turf. The green and yellow striped poles that are placed on both sides of the fairway before each green are the closest point to the green that a golf cart should proceed. All carts should be taken back to the cart path before reaching these poles. This includes both sides of the fairway. All carts should pass between the tee and poles when proceeding to the green. We move the poles frequently to reduce cart wear patterns. There some zoysia areas of fairways that are weaker than others. Most of these areas are near the edges of the fairways where heavy shade reduces the vigor of the zoysia. 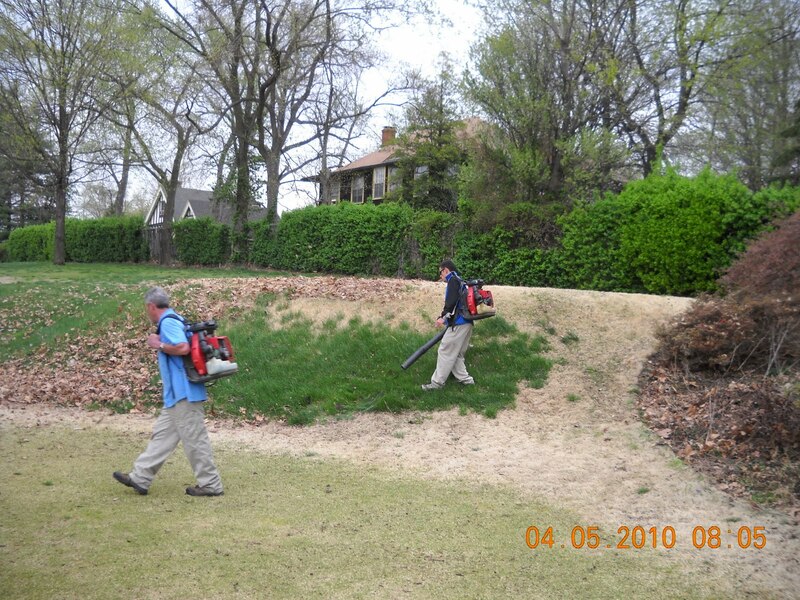 Driving around or keeping carts out of these areas will be most helpful to the turf whenever possible. 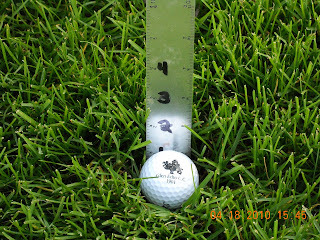 The middle of the fairways are usually where the strongest turf is located. Of course if we all could hit down the middle, that would be where we would be driving. Fairways only, its a great time to be out on the course! The staff finished the sod work over the drain line on #12 fairway today. We have part of the upper section roped off and there are cart signs down both sides of the area to direct carts away from the trench. We will circle the trench and sodded areas for ground under repair. Please following the signs and do not drive carts across the trench line to prevent thesod from being damaged. Finished area with cart signs directing carts to not cross the fairway until the bottom of the hill on #12. 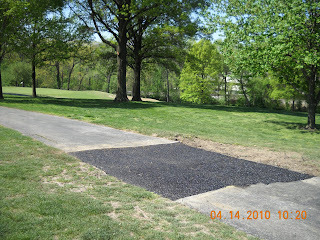 There was a silver maple growing next to the cart path on hole #18 that was allowed to grow too close to the path. Not only was the tree a hazard for carts passing by but it was raising up the cart path creating an issue for carts and equipment to pass safely. It was getting to the point where golf carts and our riding greens equipment were having to go around the spot and driving out onto the turf. 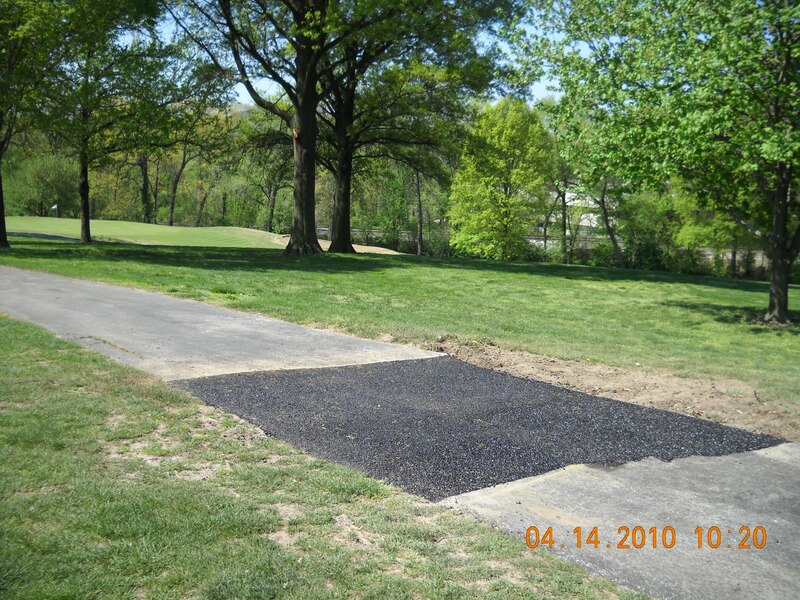 The tree was removed and we are in the process of removing the asphalt and placing a new patch over that section of cart path. We cut the asphalt today and some of the roots which interrupted the surface of the asphalt. The remaining work will be completed tomorrow morning. 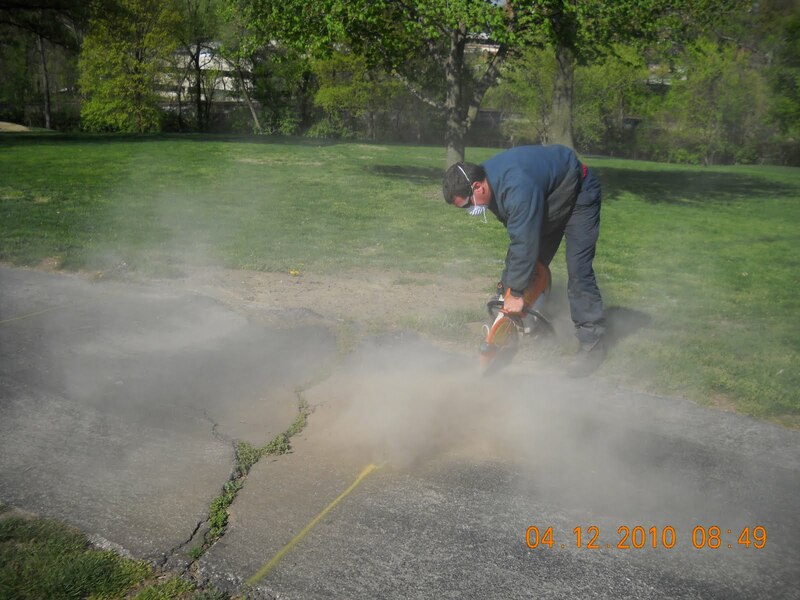 Russ cutting through the asphalt with a saw. A dirty job. 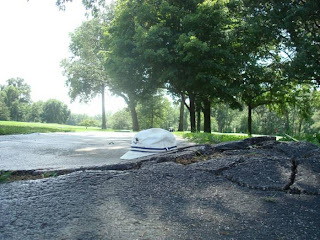 I'll post updated pictures of the completed asphalt patching and drainage work on #12 once the work is finished by the staff. I posted a picture the other day regarding the water problem that we are having in the middle of the fairway of #12 with an explanation of what we believe created the issue. An old clay tile became clogged and was backing up and leaking out into the fairway. This morning, the staff trenched a drainage line from the clay pipe at about 145 yards from the green to the bottom of the swale at about 110 yards. 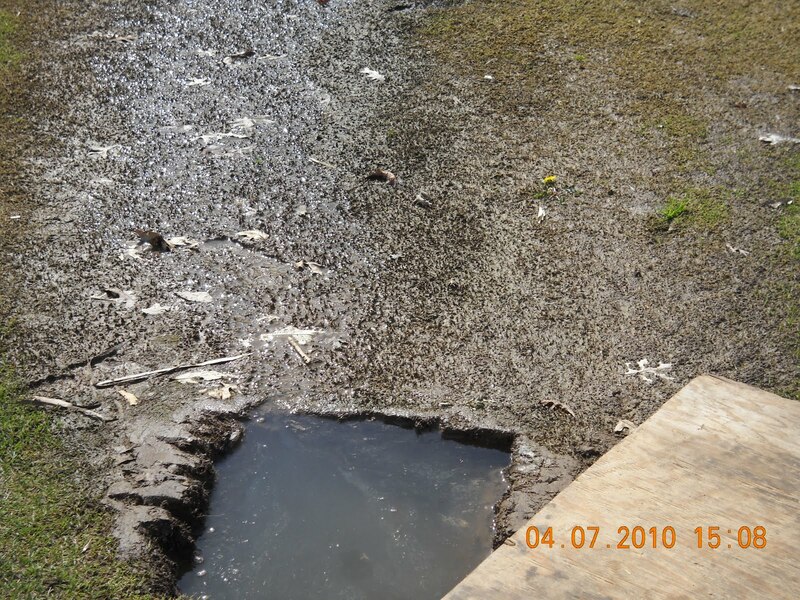 There is an existing drain tile that helps in removing water through the swale area. Assistant Skip cut off the zoysia sod and Assistant Mike and myself pulled the sod off of the run. Skip did the trenching and Russ and Skip laid the solid 4" pipe and backfilled and tamped the dirt back into place. The only thing left to do is to lay the sod back in place in the morning. Only one picture of the operation, we were busy verticutting, topdressing, dragging, mowing and spraying greens while the fellas were finishing the drainage work. Assistant Skip aligning the trencher to continue down to the bottom of the hill. The existing sod will be laid tomorrow back in place. Behind Skip and to the right is the spot where the water was coming out throughout the winter. (Straw colored turf) We will probably have to replace most of the sod in that spot. For those of you who have played in the last couple of days, you've probably noticed that the fairways are a little shaggy in some areas and you are probably wondering when will we allow carts off the paths for everyone. 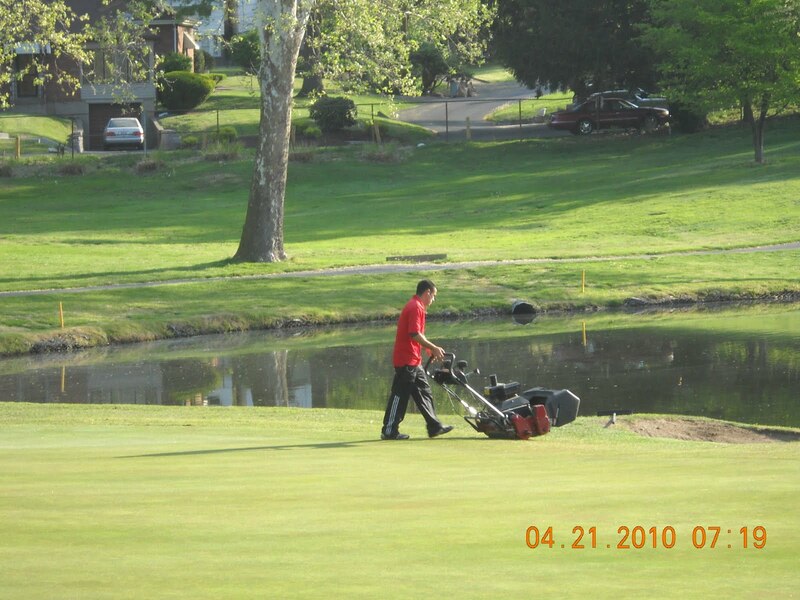 We plan to begin mowing early next week and will allow carts off paths once we have started the mowing process. 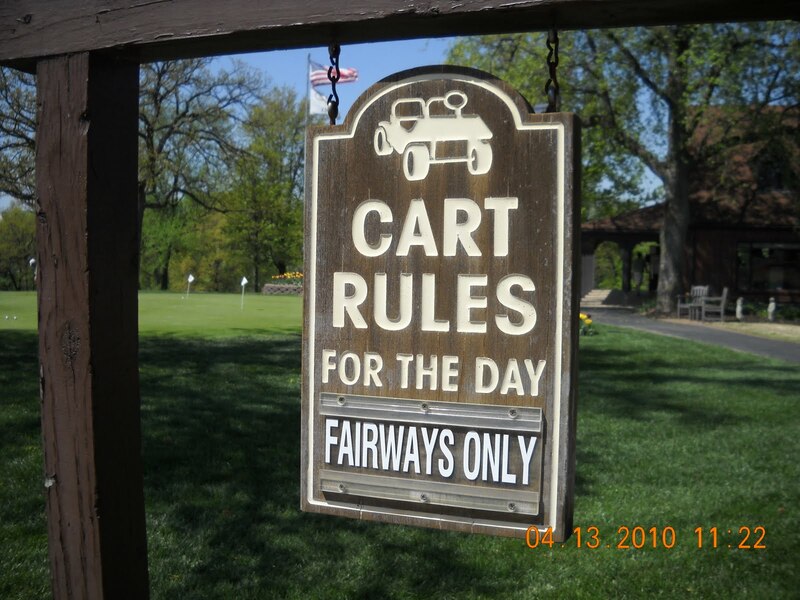 During the season, carts will be asked to remain on paths because of rain. There are occassions that red flags will not be allowed off of the paths as well. Once it begins to dry, we will check the course and will notify the pro shop when red flags are acceptable again and when all carts can be off the path. We have not mowed and let carts off paths because the turf/soil is still slightly soft and I felt we needed a couple more days of warm, dry weather before both my equipment and carts could go off paths without causing injury to our zoysia. We appreciate your cooperation during the dormant period of the season for our zoysia fairways. There could be some areas that will not handle traffic for the next few weeks where you might be directed by signs or stakes and rope for you to remain out of these areas. Roped areas are set up to protect the turf and our members. No carts including red flaged carts should enter a roped area. Bottom of the hill on 3 to the pull off area. Approach of #8 on the north side of the road. The bottom of the hill on #10 to the green. #12 at the start of the fairway and around the 150 yard mark to bottom of the hill. Right side of the trees on #2. Right of the cart path on #3. The entrance to the fairway in front of the red tee on #4. Left of the cart trail on # 7 along the tees to #5. Right side of #8 approach in the trees. 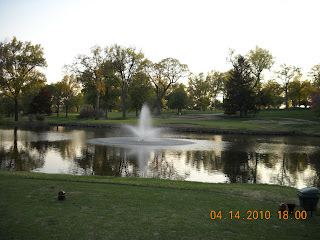 #10 in front of white tees to the lake and on both sides of right cart path until it crosses the lake. Right side 10 rough before 15 tee next to the lake. #12 between red tee and fairway and the bottom of the hill at about 125 yds from green on both sides of the fairway. #13 bottom right of the fairway which we hope to address in the next few weeks. Between # 15 & #16 once you cross the dam for about 75 yards on the right. #16 to the lower right of the green approach. Assistant Mike made our first bermuda grass eradication spray of our fairways on Friday. As you might remember, we have 4 fairways(4, parts of 7, 8 and all of 13) in our program. We have gone from full fairway applications to spot applications to help reduce the negative impacts on the zoysia. Our sprays are made going into dormancy in the fall and coming out of dormancy in the spring which has the best chance to injure the bermuda. The more severely it is injured, the better opportunity for the zoysia to begin to get the upper hand and we rid a majority of the fairways of the bermuda grass. Last fall, we sprayed an additional acre of spot spraying on all other fairways except #5. We did not spray every spot of bermuda but enough to use one acre of spray. This spring, we spot sprayed 2 acres of product on 4, 7, 8, and 13. We sprayed another 3 acres over the remaining 11 fairways which increases our total acreage sprayed to about 5 acres. We have 26 total acres of fairway. Our plan as usual is to make the first application and then make a second application around May 10th. We will evaluate the effects the first spray made and get a good idea of how much zoysia is actually present in some of the bermuda areas. As we did last season, we will replace the worst spots of #4,7,8, 13 with zoysia sod from our nursery. I don't think we have enough spray applications on other fairways that might warrant sod replacement but we will evaluate that situation as we move closer to the end of spring/beginning of summer. As mentioned in last seasons postings regarding our program, there are some patches of bermuda that are just too large for us to completely kill all at once because of the cost to to replace the sod. We will attempt to injure some of these areas to allow the zoysia to continue to move into the area. Our second application will target areas where zoysia could have the opportunity to over take the bermuda grass. 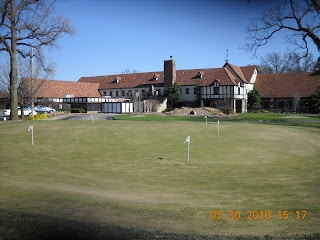 As we've seen in the last season, the zoysia will turn a little off color for about 10-14 days but will green up. The bermuda that has only received one treatement, will turn very off color but usually becomes green again around 21 days after application. For new members, go to the label section of the blog on the right hand column and click on bermuda eradication program and all the postings in the last year or more related to this program will appear. This will give you additional details on our plans and will show pictures of the past spray programs and their affects on the turf. Our goal is to get the fairways green again from chemical injury by mid-June and leave them alone until August where we will then begin our late summer/early fall spot applications. We are also evaluating the use of another product which is much less expensive on our fairway nursery and the right side of #5 fairway. Assistant Mike spot spraying #4 fairway. Mike started our broadleaf weed control applications today. We normally start at the end of March but rain and aeration got in the way plus high winds prevented us from spraying last week. We do not intend to do a wall to wall application but will be area spraying high visible areas, green surrounds, tee surrounds, first cut of rough, clubhouse lawn and other areas. One of the more prevelant weeds that we have on the golf course is prostrate knotweed(Pg 19 in the MU Turfgrass and Weeds guide). Assistant Mike out spraying the short range tee area which has a large number of dandelions(Pg 17 in MU Turfgrass ans Weeds guide) and other broadleaf weeds. Our close cut of rough will be sprayed in the next couple of weeks as our bermuda rough comes out of dormancy with our combination product that we are utilizing for our bermuda eradication program in the rough. One of the two products is a broadleaf weed control which assists us in taking care of two different problems at once, injures the bermuda and kills boradleaf weeds. $ 167 versus an average since 2006 of $ 764. Our total natural gas cost through the 4 months has been $ 985. versus an average of $ 4250 since 2006. The wood burner unit paid for itself and we saved about $ 1200-1300 in cash flow this year. 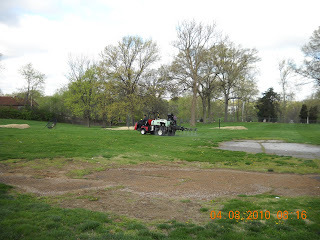 We have not started any treatments on our fairway bermuda eradication program this season but I wanted to show you a couple of pictures of how our treatment program is working. I expect if the weather cooperates over the next few days that we will make some spot applications on a majority of our fairways on the golf course. We will also be doing some treatment in the first cut of the main rough areas as well. I saw a presentation in Kansas City over the winter by Mr. David Stone who is the superintendent at the Honors Club in Chatanooga, TN. 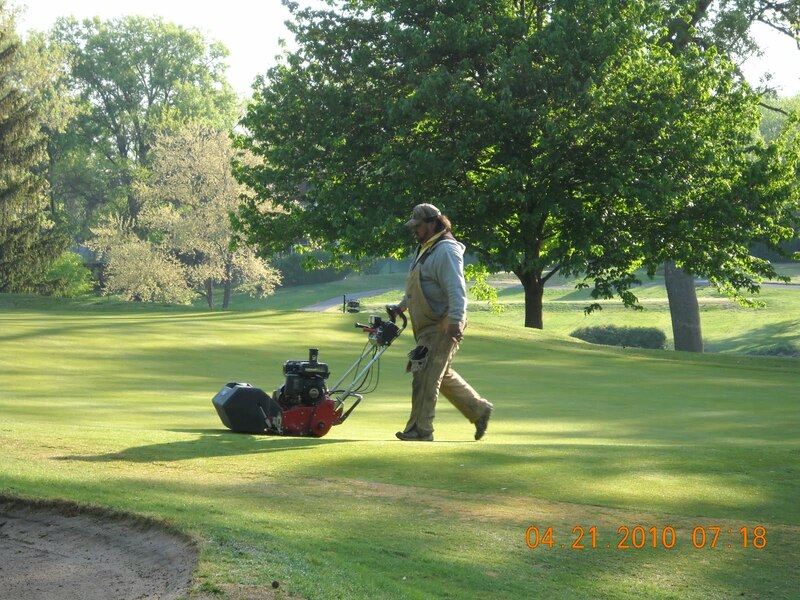 David is one of the most respected superintendent's in our business. He has been involved with a great deal of testing of bermuda eradication products. We are going to begin testing Fusilade II to potentially replace Acclaim Extra in our combination spray. 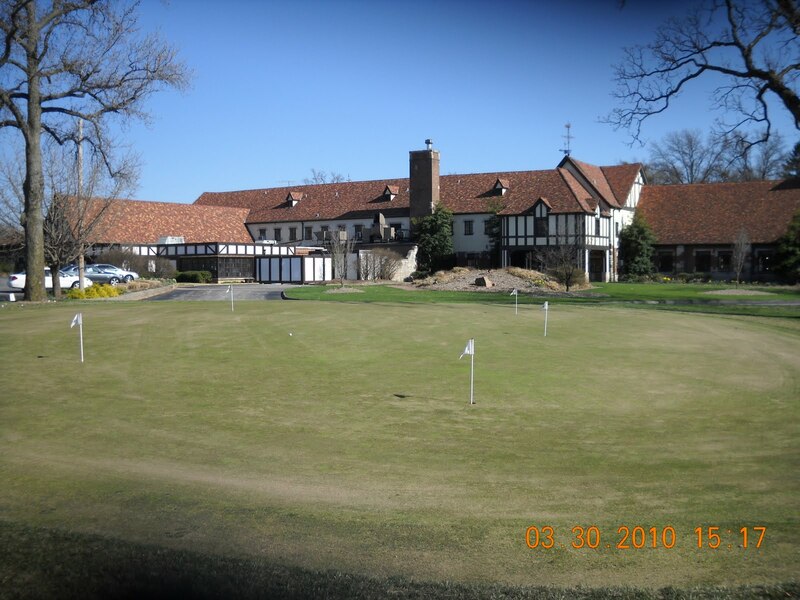 There was an issue with Fusilade used at this club a few years ago but it was an application error made by a contracted service. The cost of this product versus the Acclaim plus the potentially less harm that the spray has on our zoysia are the reasons why we will be testing this product. 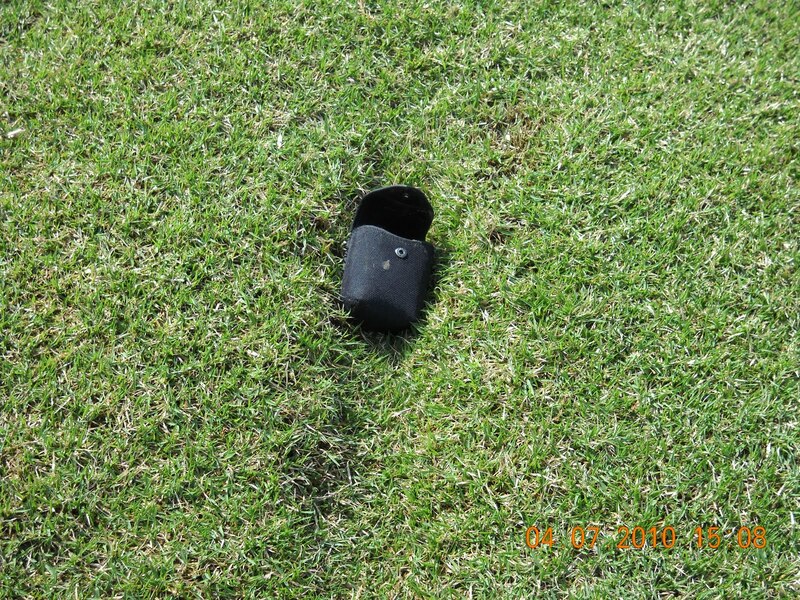 We will make some initial test applications on our nursery areas and will keep you informed of the results. Once we feel confident about the material, we will begin to move it into our regular rotation. 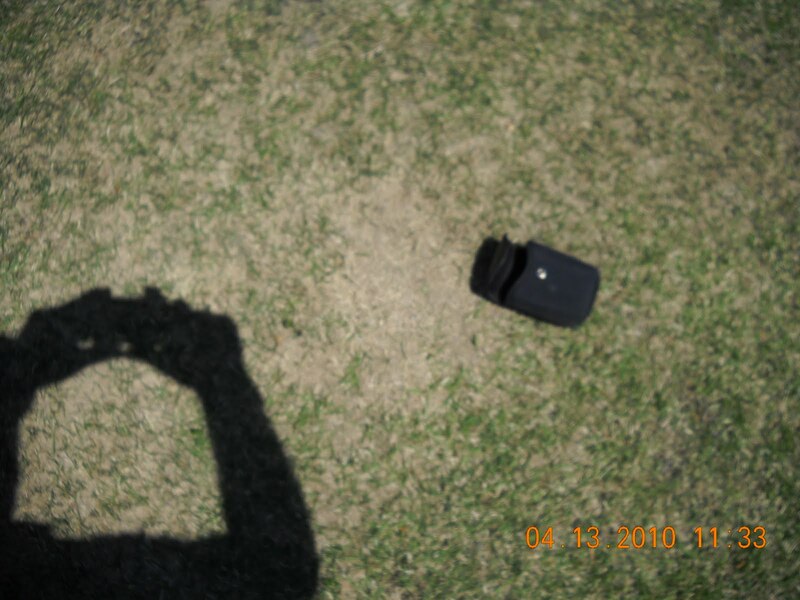 The first picture is at the bottom of #7 fairway. 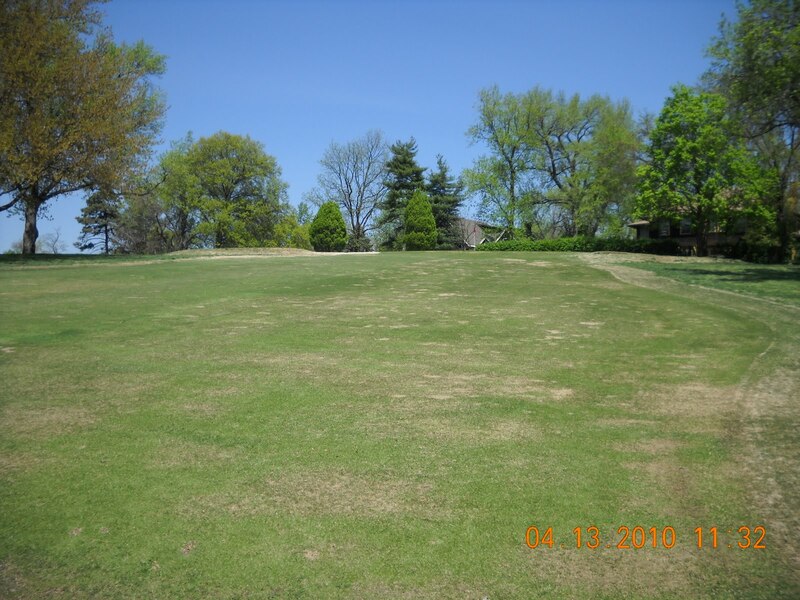 The top part of the picture is zoysia and the lower half of the picture is bermuda that has not been treated since we started the program in the fall of 2008. The bermuda is very healthy and is in need of a mowing it is growing so fast. The picture below is of #4 fairway at about 200 yards or so off of the tee in the middle of the fairway. This spot of bermuda is almost completely dead. There are a few small hairs of bermuda trying to emerge. This spot has probably been sprayed about four times since we started the program. There is a stark difference between the straw look of the bermuda in the bottom of the picture versus the healthy look of the bermuda in the top picture. 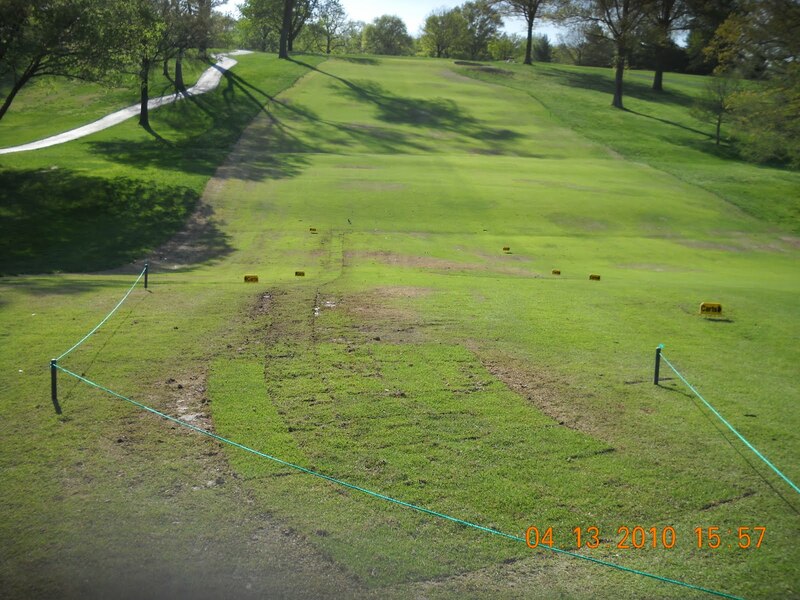 Over the winter, our staff noticed that the zoysia sod on #12 fairway directly in the middle about 130 yards from the green was pushed up slightly and water was draining from the spot. It was not water from our irrigation system since it was shut down and the water was blown out of it in December. We thought it might be water getting into an old irrigation pipe and draining out. Most of those lines were tapped off by the new irrigation system installers 3 years ago. It was time to get this problem corrected so Skip and Russ went out and started to do some digging. When we went out to explore, we found another spot up the hill which had become very wet as well. (Clay pipe) The original spot had water squirting out of the soil above the new irrigation line. We went up to the other hole and found an old 3" clay tile drain line where the pipe were butted up against one another, not the end of the pipe placed in a bell. It appears to be running at an angle across the fairway from right to left toward the flat area at the bottom of the hill. 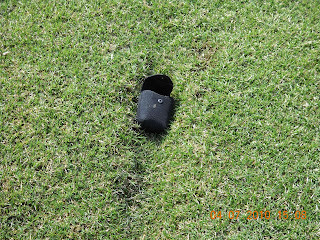 Skip came walking up the hill along the new irrigation pipe and noticed that the sod above the line was caving in. Either the water from the upper area or the drainage pipe which is crossing the line found a soft spot in the soil where the new irrigation piple was pulled through the fairway. 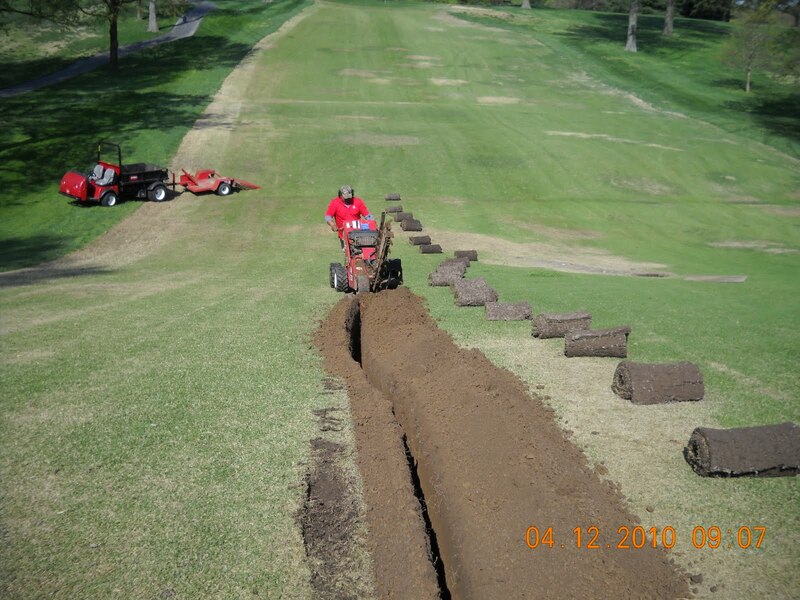 We are first going to attach a drainage pipe to the upper section of the clay pipe and trench a line down to the flat area where we can attach into an existing drain line that runs across the fairway. Hopefully, this will eliminate the water from coming out of the original spot. Clay pipe that is draining water from somewhere above this area. This hole is at the top right of the previous picture. Area that is sunk in the middle of the fairway where the water that backed up has found a path and eroded soil away from pipe until it came out of the ground at original spot in fairway. Original spot that we were concerned with over the winter. The hole is full of water again after we pumped it down yesterday. You can see the excess water coming out of the dig hole and the soil/algae that is building up on the turf. As the weather has warmed over the last few days, so has the pace of our perennial ornamental plants on the golf course. The guys spent Monday pruning, raking, blowing and spreading pre-emergent on our ornamental beds. 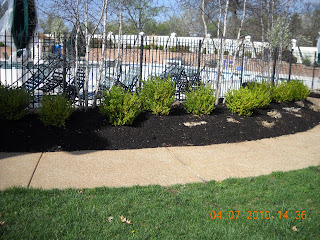 We are also beginning the process of spreading mulch over the beds to give them a fresh look for the season. 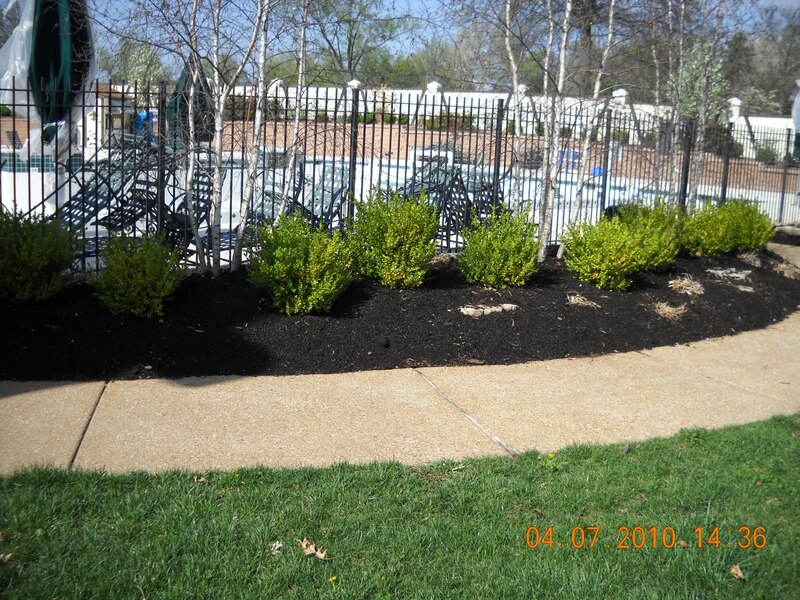 This year, we are using a new mulch called Black Forest from St. Louis Composting which I believe will be more beneficial for our plants. 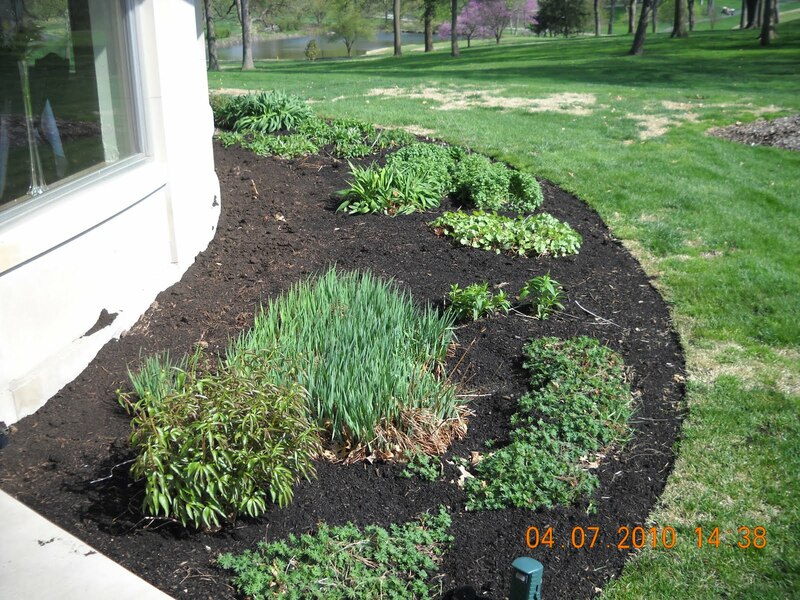 Its a combination of leaf compost and mulch. It has a much darker color and I believe it will hold its color for a longer period of time. The compost will also be very beneficial for the soil and should begin to improve the health of our plants over the years. I believe that plants should be the real show of an ornamental bed but I do understand the need for mulch to be freshened up after a few months. Nick and Tom clearing the leaves from the bed on Tee #7. The sunroom ornamental bed with the new mulch spread over the top. The planting outside the swimming pool fence. 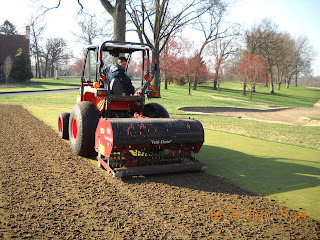 Our core aeration program was completed last week. 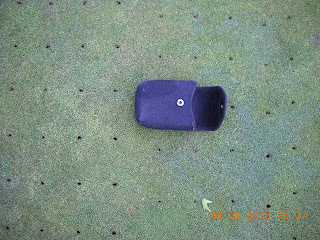 The program involved using our Verti-drain aerator with a 1/2" hollow tine set to a depth of 6". 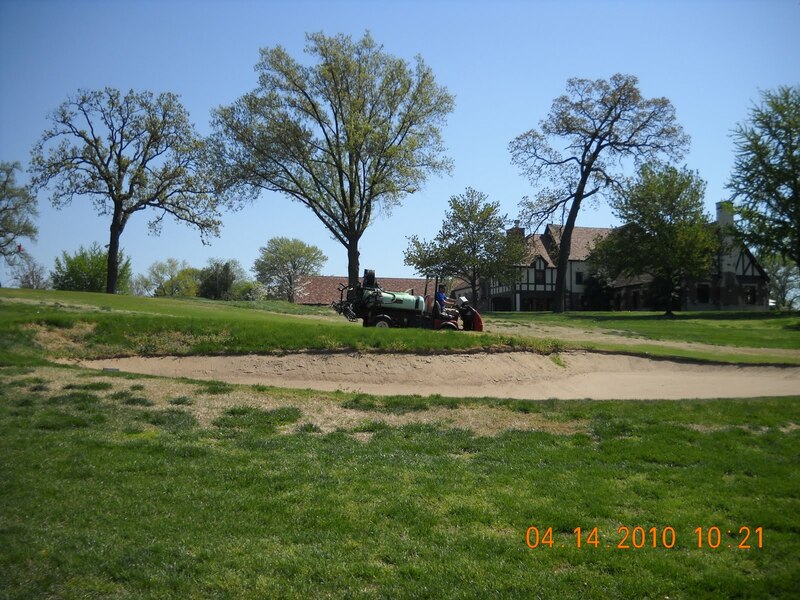 The USGA green construction recommendation includes 12" of sand, a gravel layer with drainage. 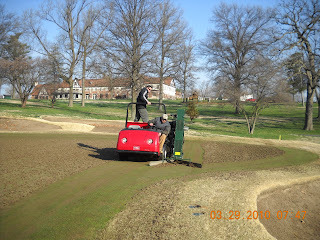 We have push up greens construction at Glen Echo which has been modified with sand topdressing over the years. There are no drains in our greens except for #9 which is the only all sand green with drainage on our property. 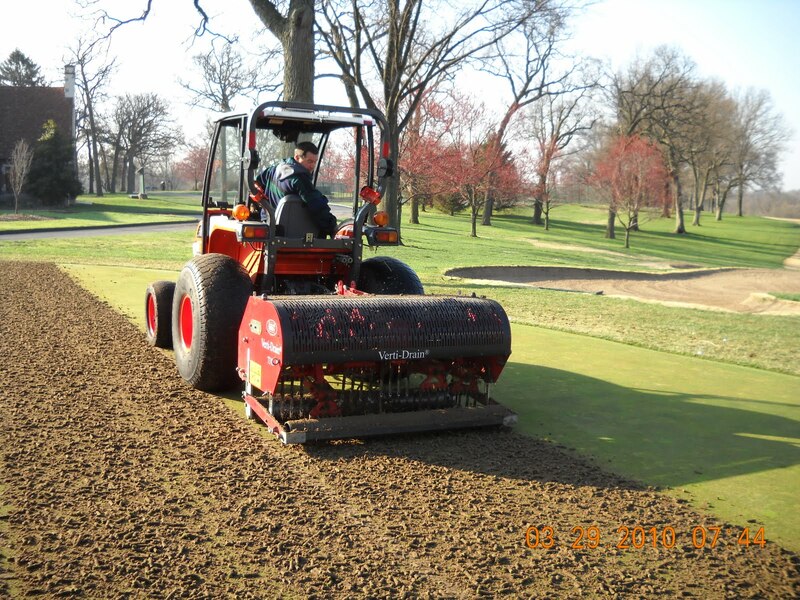 The sand that has been used in the topdressing program has accumulated a depth of 3-4" per green over the years that this practice has been utilized at Glen Echo. The water that enters our green system can only evacuate out of the green profile by moving through the sand and soil layer. When the soil layer under our greens becomes saturated, the water will drain along the sand/soil line from the highest point of the green to the lowest point and will move out of the green through the soil which is usually the front area of the green. Water that has to move across the green profile is much slower to leave the green complex than water that will go straight down through the profile of the green. Our deep coring program is placing sand channels in our push up soil layer which will allow additional water to go through the profile of the green. Entry points can also be made into the soil using channels made with our needle tine venting of our greens each month during the rest of the golf season along with our 1/2" solid deep tined aeration in October. The slower the water moves out of our greens systems, the greater the impact on putting green quality. The wet conditions can lead to the course not being opened or delaying return to the golf course, large ball marks and slower green speeds. A wet green surface can also lead to the green not being mowed for the day because the surface is too soft and the mower could scalp the turf and create extensive damage. Saturated root systems can lead to root decline, disease and or death. Water is a very good conductor for heat and cold. In the summer, we are concerned with our root systems becoming too hot which is one of the reasons we attempt to keep our water use to a minimum. 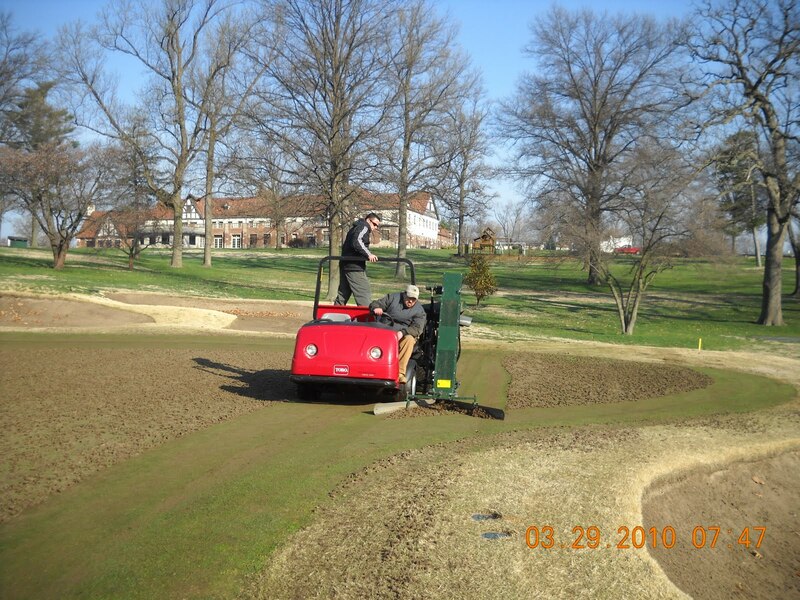 The picture below shows Russ pulling cores from the practice green with the verti-drain aerator. The next picture is our core harvester which picks up the sand and dirt plugs. This is the first season that we used the more modern 4 wheel drive Workman to pick up the cores. Its has much greater bed capacity and creates less imprinting of the tires into the surface of the green which is softened from the aeration process. Last season we had some severe rutting from this operation using an older 3 wheeled machine. Once the cores were picked up, we used our topdressor to apply about 50 tons of sand over the 20 greens. We then used our leaf blower which is pulled by a cart to begin blowing sand into the holes of the green. Also, we did some hand brooming of greens which had a heavier concentration of material. Once a large amount of sand has been blown into the holes, we use our cart drag brush which filled more holes and smoothed the sand to a consistent covering around and over the crowns of our bentgrass/poa greens. Since the greens had their growth reduced from plant growth regulators, there was very little turf to mow so we rolled the greens to help smooth the surface. The greens were fertilized and a micro-nutrient soil building product was broadcast by walking spreaders. The view below is the practice green on 3/30 after completion of our work. 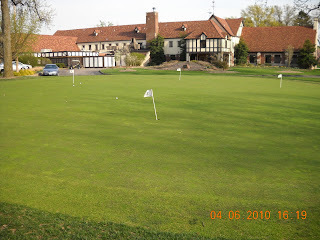 The practice green a week later with some warms days and fertilization. The heat of the past week has helped push the growth and color of our greens. We've also been fertilizing and adding micro nutrients to the greens to improve the recovery of our turf and assist in spring root growth. The poa annua has been coming out of its funk over the last seven days. We've just applied our second seedhead reduction combination product. We will also be applying some additional growth regulator product to reduce the poa's growth habit and help improve our ball roll over the next few weeks. The USGA has a video on greens aeration.